The Apartments Coniston Self-catering5 contemporary, spacious, warm and cosy apartments have been created in an old house in Coniston by Steve and Angela Ellerton. We are a 2 minute walk to the village centre with pubs, restaurants, cafes and shops close by. With meticulous attention to detail, homely touches and all the mod cons, the Apartments are perfect if you want a relaxing stay in a clean, fresh space in the Lakes. After a long day exploring, adventuring, walking or sight-seeing, the Apartments are a wonderful haven in which to unwind, make a delicious meal and enjoy a glass of wine with friends or family. Each of our Apartments are fully self-contained and set up with everything required to enjoy your visit to the Lakes. Each Apartment has its own unique décor accommodating from 1 to 5 people depending on the Apartment. Featuring a spacious layout, luxury mattresses and warm duvets, fluffy towels, and modern kitchen equipment, they are designed so you can self cater properly and relax completely once your day here is at an end. We live at The Apartments and we’re always on hand to help, either with advice about how to enjoy the Lakes (whether walking, cycling, playing golf, eating out or finding out about a local show or event), or with anything that you need to make your stay a bit more comfortable. We look forward to welcoming you at The Apartments Coniston soon! 1 small to medium sized dog acceptable by prior arrangement in Apartments 2 and 4 only. Central Heating currently to Apartments 1, 3 and 5. New Electric heaters in Apartments 2 and 4. A new secure cycle shed with storage for 8 – 10 cycles now available free of charge, subject to prior arrangement. Babies and small children are welcome but no facilities provided. Children welcome from any age. 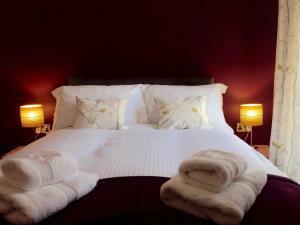 The Apartments Coniston sometimes limits bookings to 2 or more days. Northbound M6 leave at junction 36 taking the 1st exit at the roundabout A590 towards Kendal / Barrow. Southbound M6 leave at junction 36 taking the 3rd exit at the same roundabout. Stay on this dual carriageway. At the next roundabout (approx 4 miles) taking the 2nd exit onto A591 towards Windermere. Enter Windermere staying on the A591. At the next mini roundabout take the 2nd exit A591 towards Ambleside. Follow this road for approx 4 miles until you hit the next junction with traffic lights in Ambleside where you take the 1st left onto Borrans road passing the edge of the Lake and the Wateredge Inn. After 400 yards take the next left turn past the Rugby club onto the A593 signposted Coniston. Staying on the left hand side of this one-way road take the next left over the stone bridge staying on the A593 for circa 7 miles until you reach Coniston taking the 1st turning left called Shepherds Bridge Lane. At the end of this lane turn right onto Tilberthwaite Avenue. The Apartments Coniston is situated circa 100 yards on the right hand side and being the 2nd building you will see.